After a great evening of dinner, discussion of tomorrows destination, sleep, I was up at 0600 hours to quietly make the coffee with Jon and Wendy being quietly awake and rising about 30 minutes later. 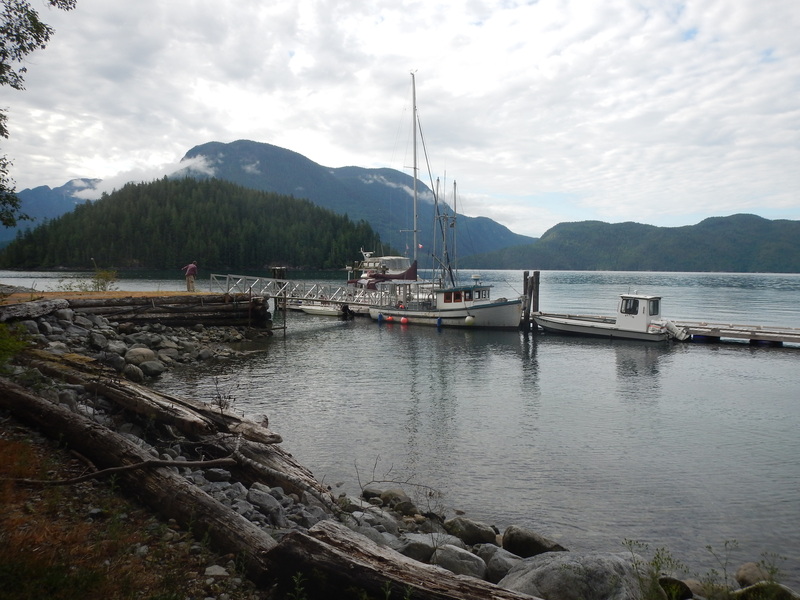 Our route for the day would be Refuge Cove to fuel up and take on water. 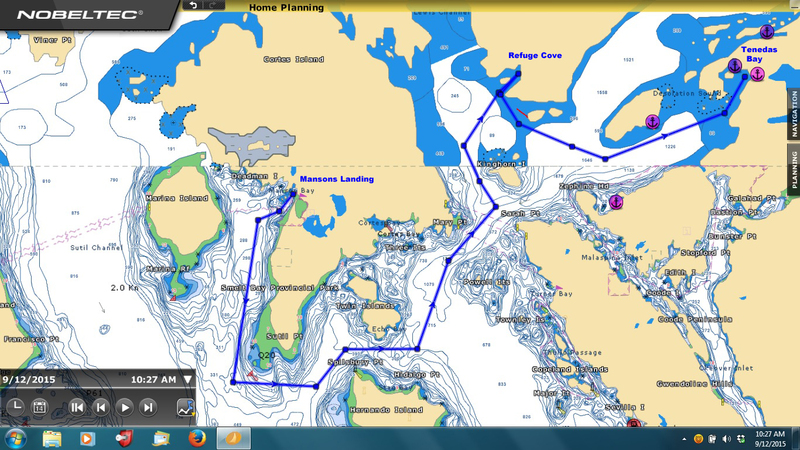 Then we would head for Tenedos Bay. 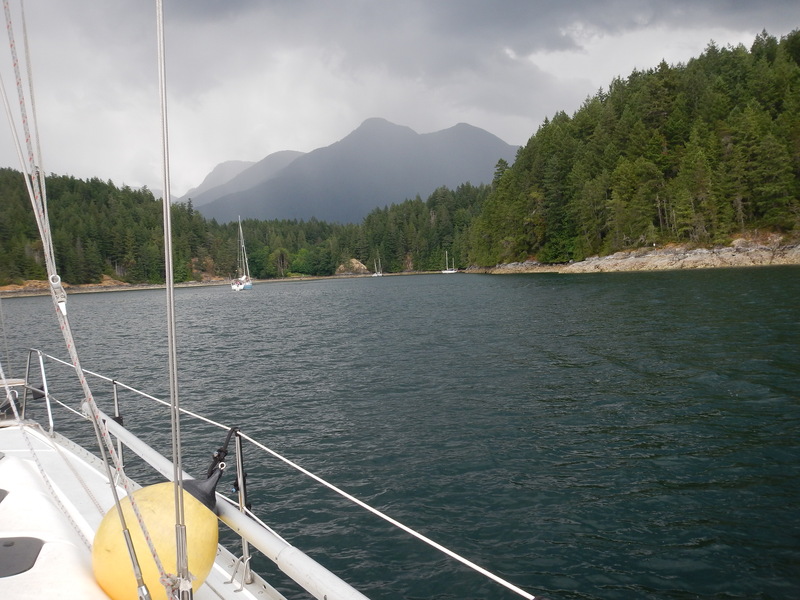 We pulled the hook and pointed the boat south as we motored down the western edge of Cortes Island to Sutil Point. 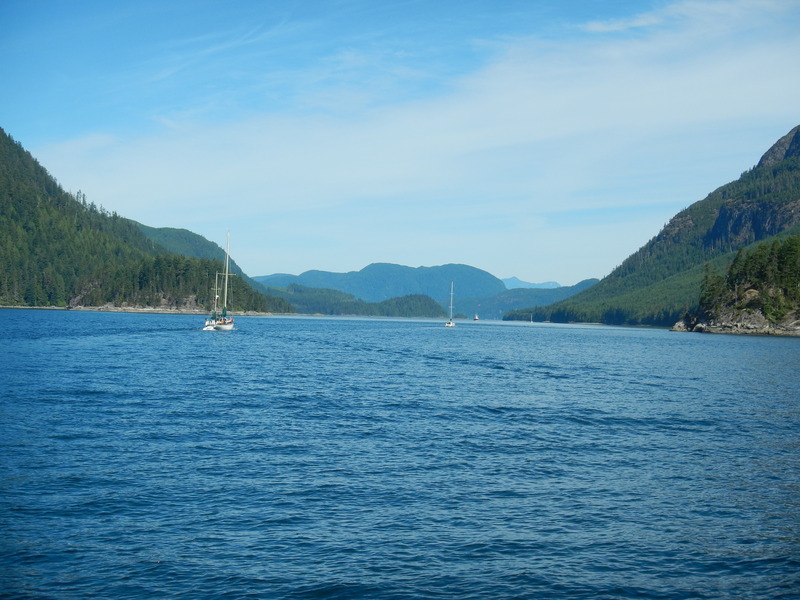 Turning towards the Baker Passage and passing north of Hernando Island we turned north toward Kinghorn Island and beyond is the Lewis Channel of Desolation Sound. 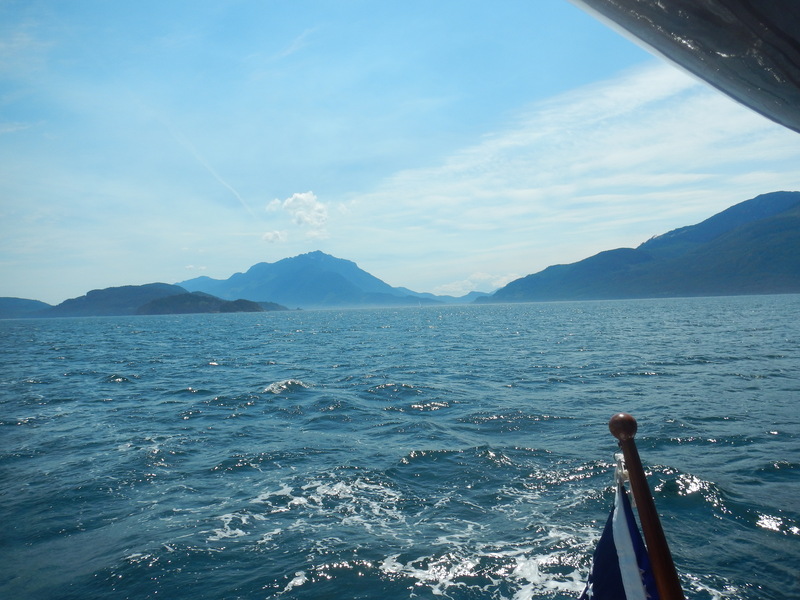 This was my first time to approach and enter Desolation Sound. The raw stark beauty……The feeling of this place was stark & intimate. With apologies to all poets I offer the following below. 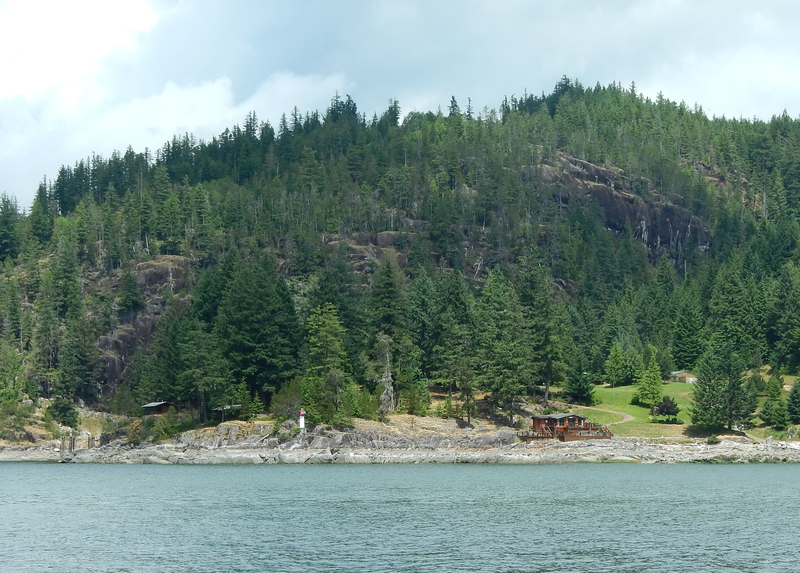 Abeam of Hope Point we came to 31º magnetic and motored the half mile into Refuge Cove. Here we had the opportunity to fill up with diesel, take on potable water, fill our propane cylinders and have ice cream & chips. 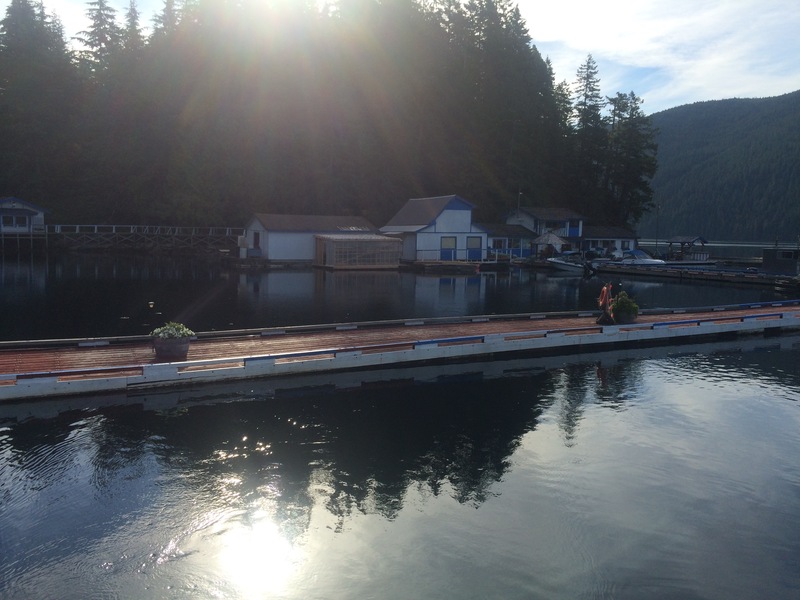 This is your last opportunity for these items and garbage disposal , for a fee at the barge, until you leave Desolation Sound. 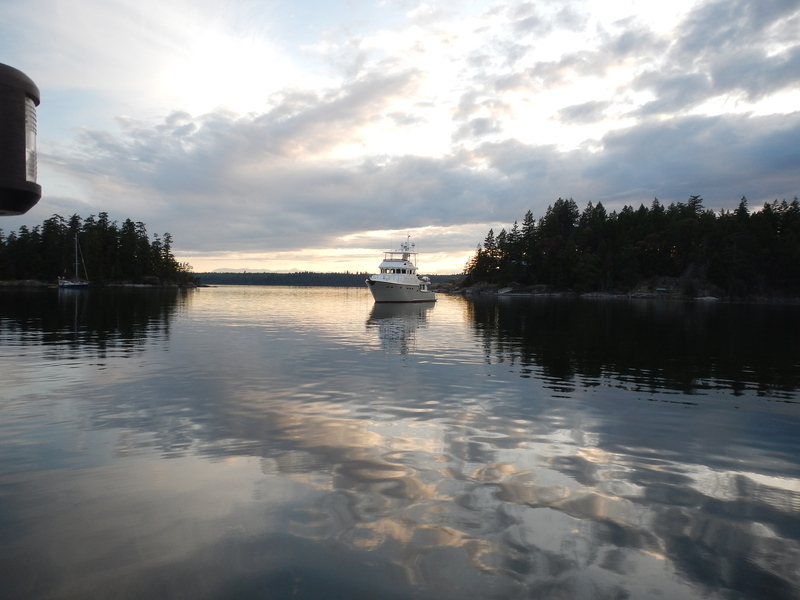 By 1400 hours we headed back out to Hope Point and pointed the boat on a 133º magnetic course past Martin Island across the sound towards the southern tip of Mink Island. 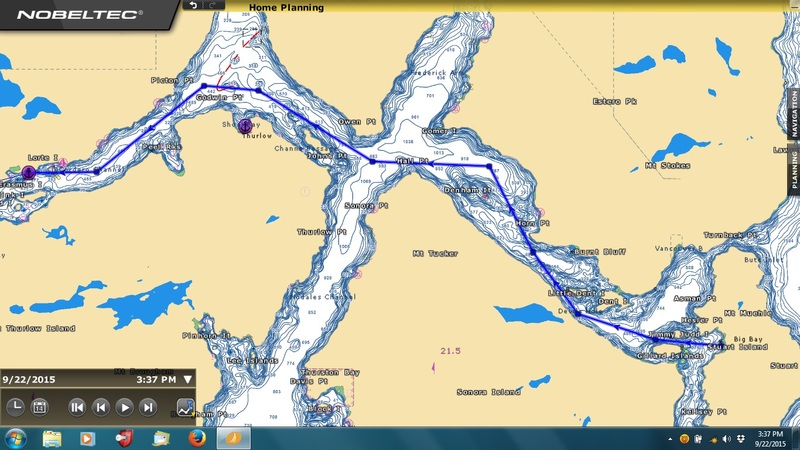 Then onto a northerly course for the last 4 miles to Tenedos Bay. 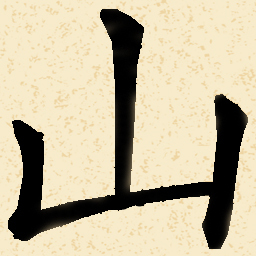 There are two bays, a NW bay and a SE bay, for anchoring. Above is our approach to the SE bay. 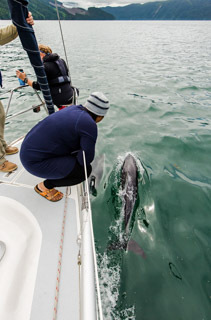 Finding a spot to drop the hook and do a stern tie was not a trivial matter for us. When all was completed it was 1 to 2 hours later! We spent a wonderful evening with food, good wine, star gazing and quiet. 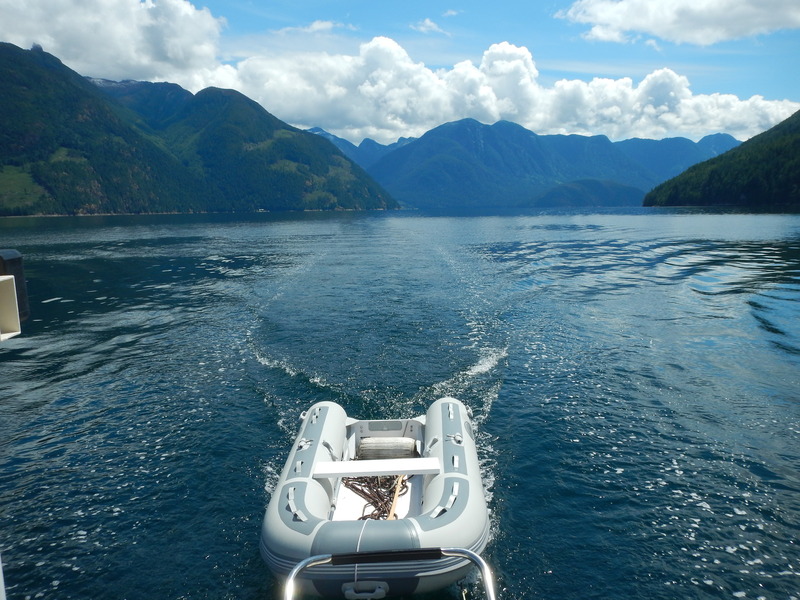 Tomorrow we will head to the Wildernest at Toba Inlet. A relaxed morning for all. There is the sense of we’re here lets be less driven. 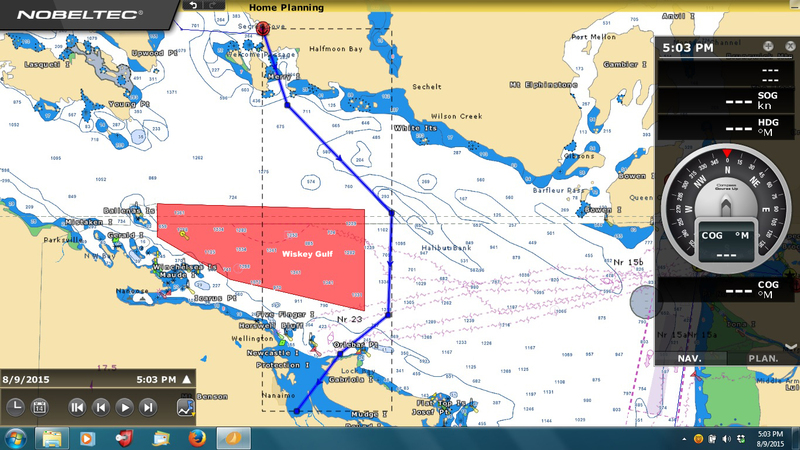 We have approximately 15nm to the Toba Wildernest up the Homfray Channel. Ken fixes breakfast for the entire crew. Pancakes, blueberries, maple syrup, butter. A feast for breakfast. With seal heads popping up to see the visitors we lounge with food & coffee while watching seals. 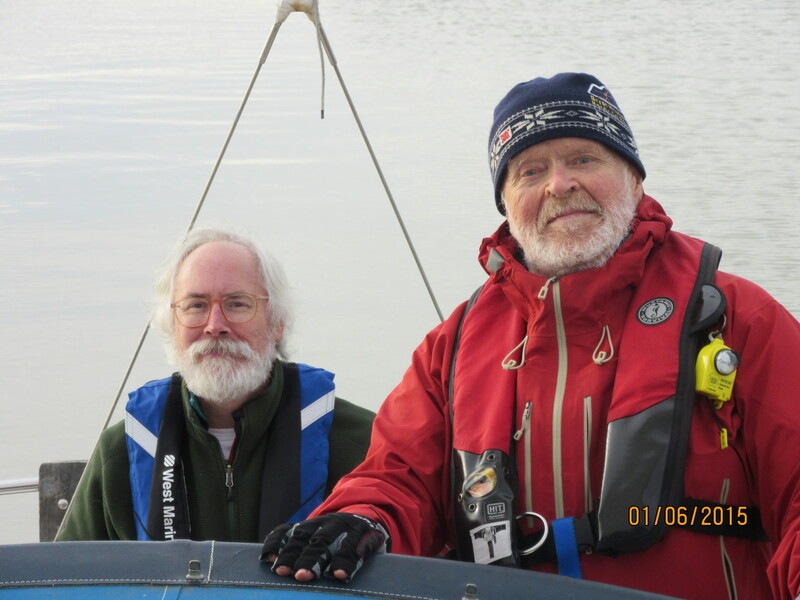 1000 hours we pull the anchor, Jon & Geoff, with Ken at the helm. 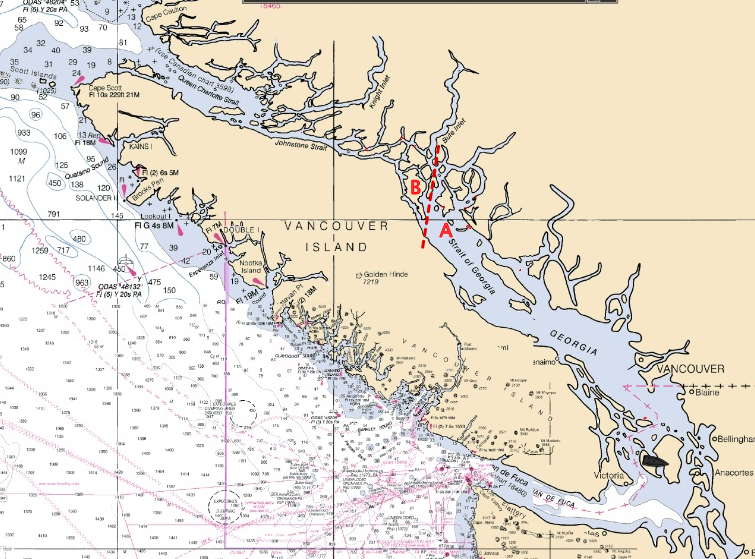 We motor out on a reciprocal of our entry course until we are past Ray Rock and then turn to 310º M to pass the southern tip of Otter Island into the Homfray Channel. 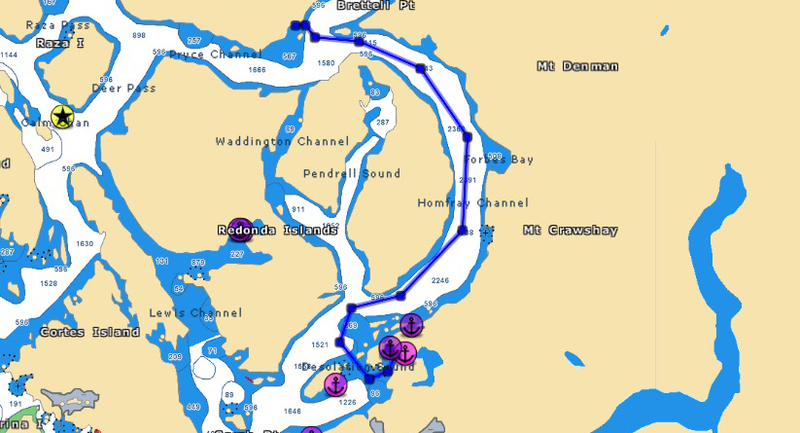 As we head up the channel we pass two bays that have potential anchorages. 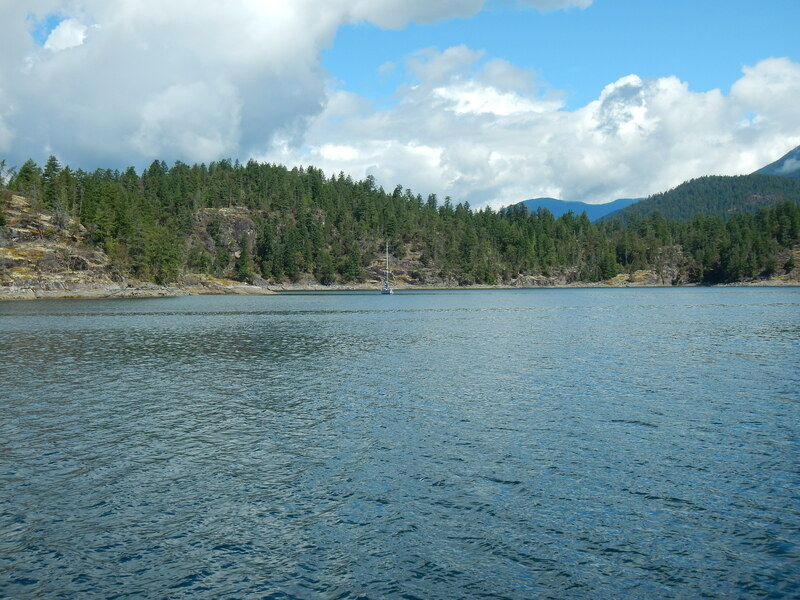 Forbes Bay, the lower, and Atwood Bay the more northerly bay. 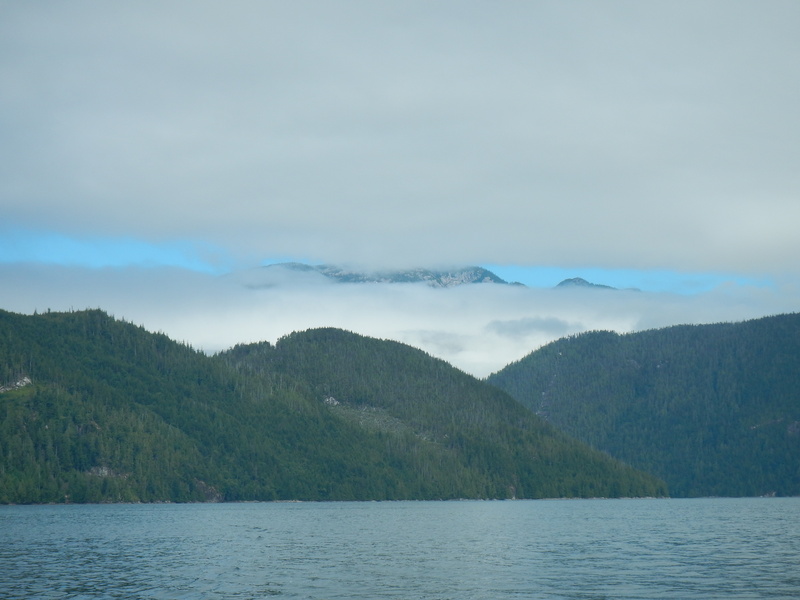 As we approach Channel Island directly off the bow we are at the confluence of the Homfray, Price, Toba Inlet. Our destination for the night. This place is a true gem. 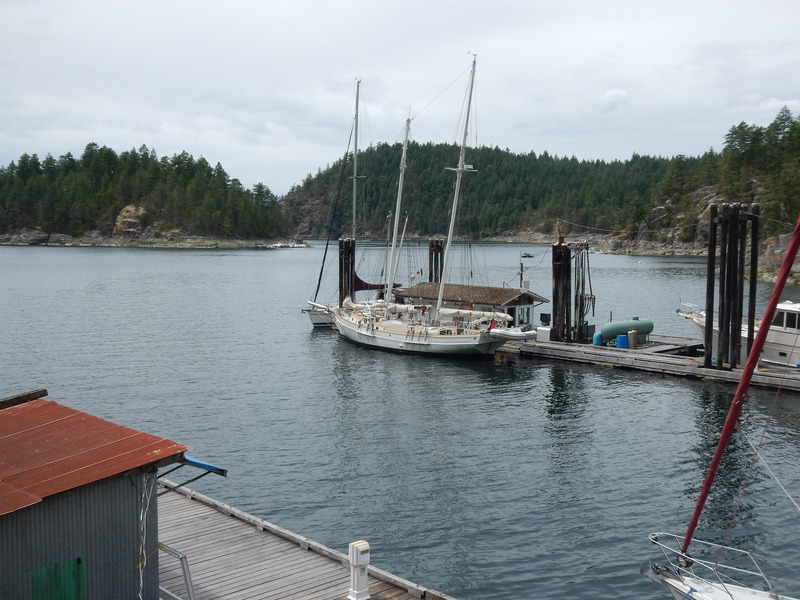 Showers, bathrooms and a dock and stunning views. We were welcomed by Ranger Kyle. He shared his knowledge about shell fish with Irene and Geoff. Kyle, his wife & nine year old daughter have homesteaded this place for seven years. The off season solitude must be both wonderful and immense. My iPhone alarm sounds and I’m up to make coffee and start the day. Sunrise is 0430 hours and sunset is 2200 hours this far north. 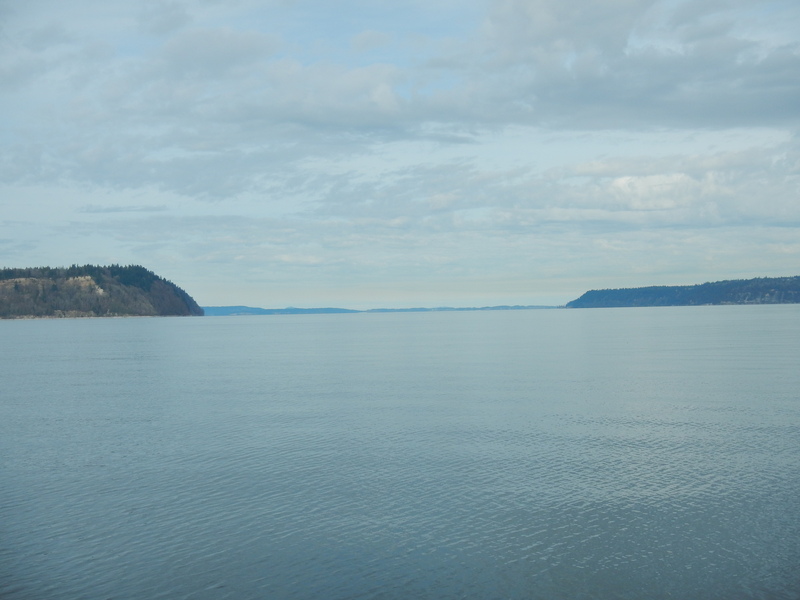 Its 52ºF, little ripples on the water fairly still. By 0815 hours everyone is up and stowing gear in the nooks and crannies of the boat. 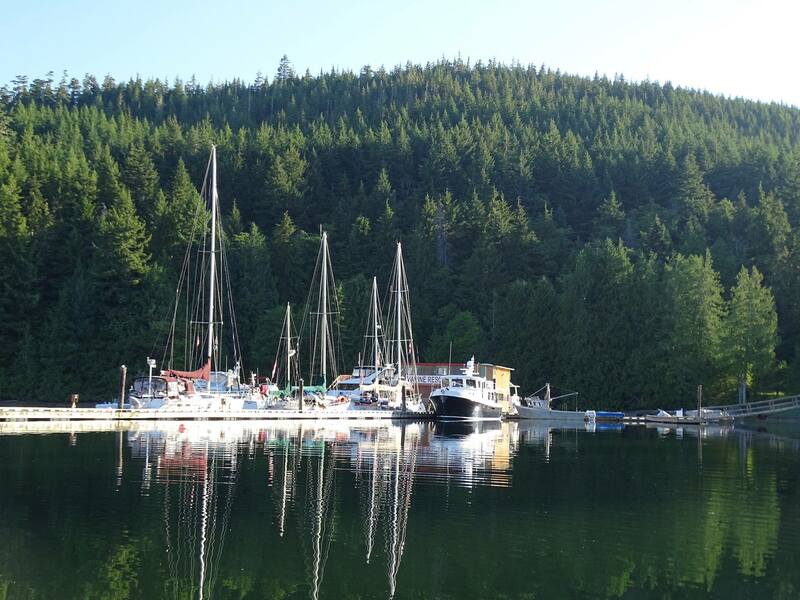 Today, we need to be disciplined in our departure time, 0900 hours, since we will transit the Yuculta Rapids on the west side of Stuart Island before we reach Big Bay for the evening. 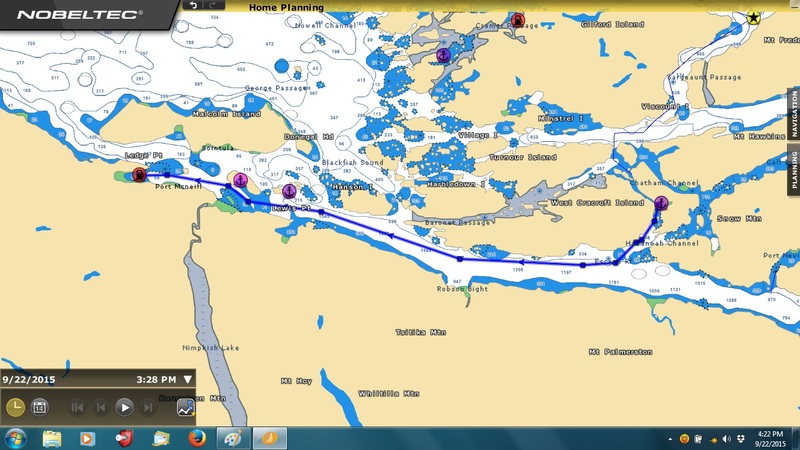 Our estimated arrival at the south end of Stuart Island is 1300 hours and slack water at Yuculta Rapids is 1400 hours. 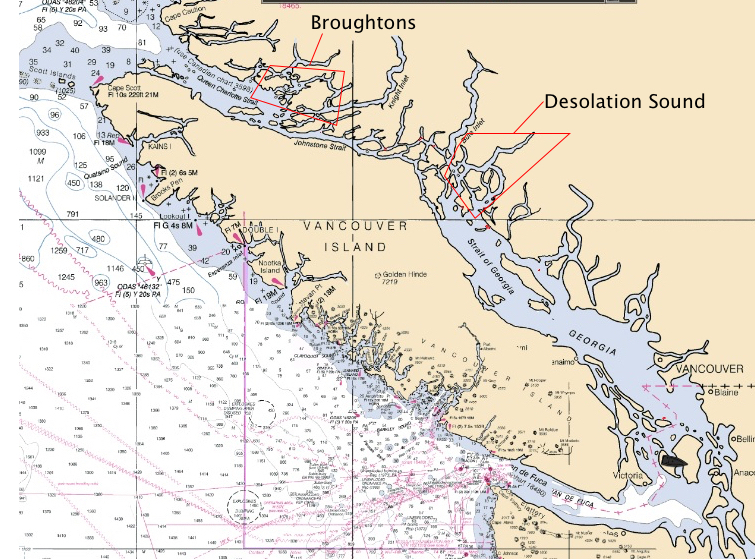 Starting today we will be leaving Desolation Sound and going to the Broughtons which are north east of Queen Charlotte Sound. 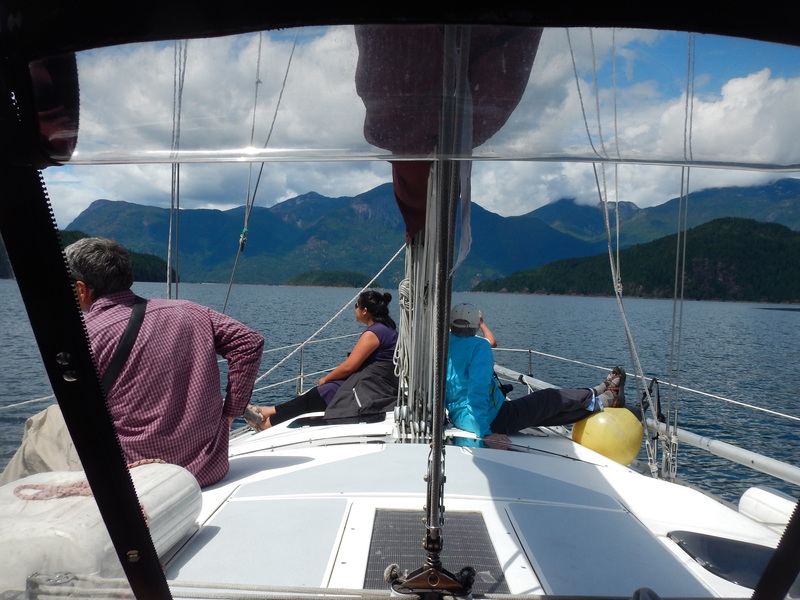 There are three passages to go from the north end of the Georgia Straits to Queen Charlotte Sound. 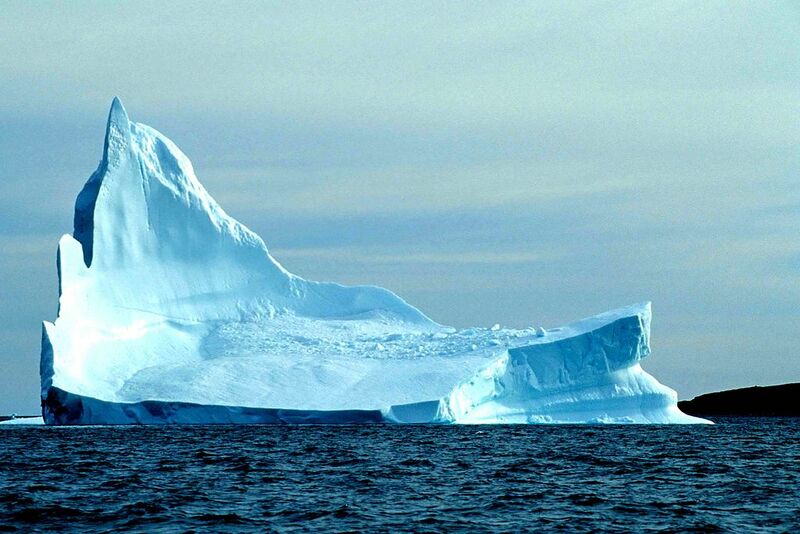 The most direct, the Discovery Passage, has significant tidal currents and fewer places to pull off if things are bad. 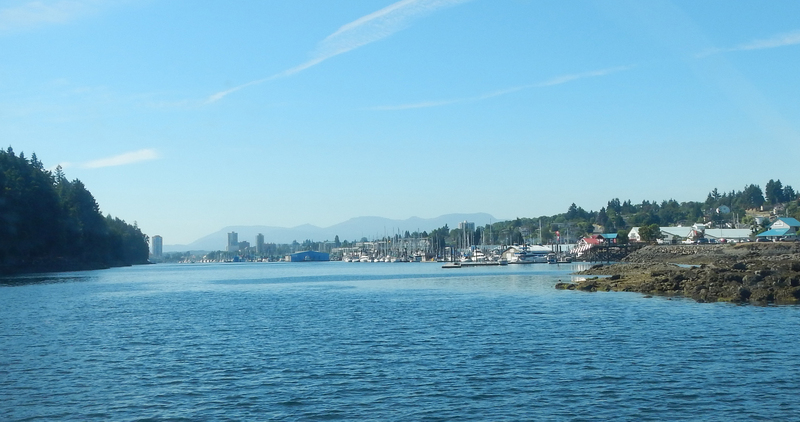 The passage using the Calm, Cordero, Chancellor, Welborne, and Sunderland Channels decreases our exposure to the Johnstone Straits. 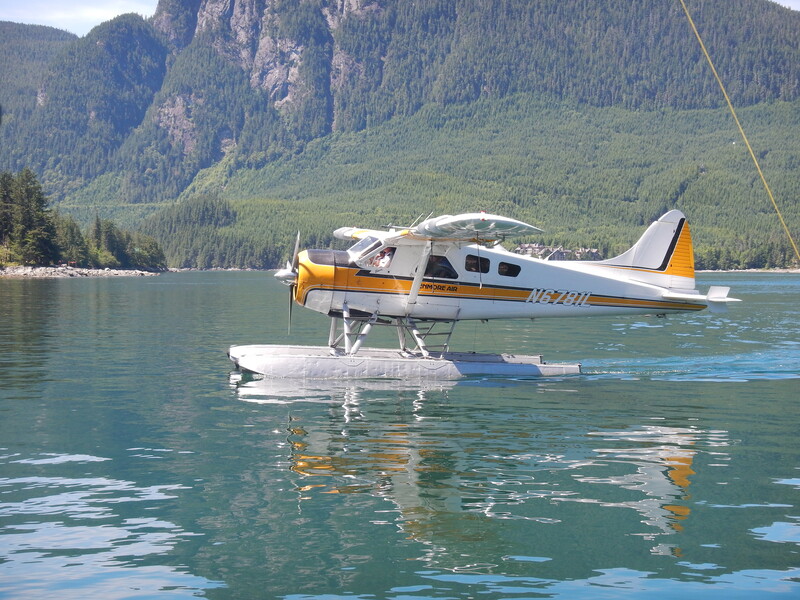 This is our choice for the transit to the Broughtons. 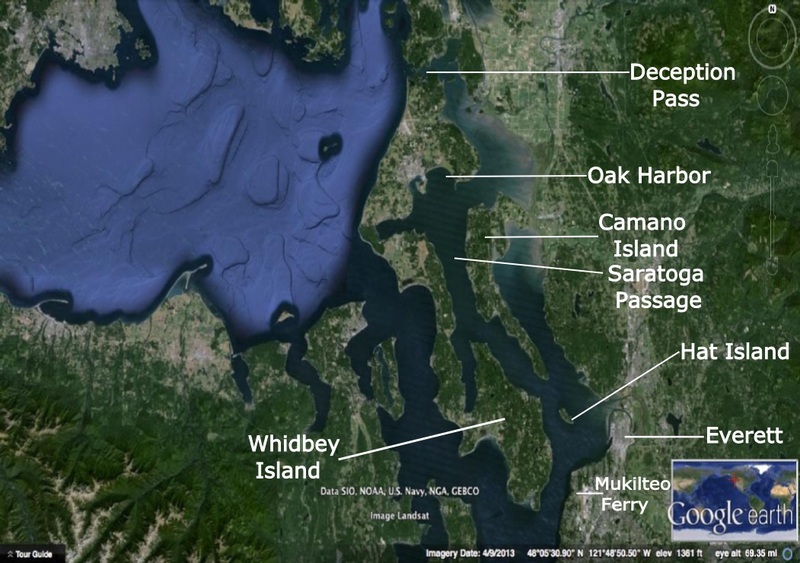 There is a middle passage but it offers more exposure to Johnstone Straits. 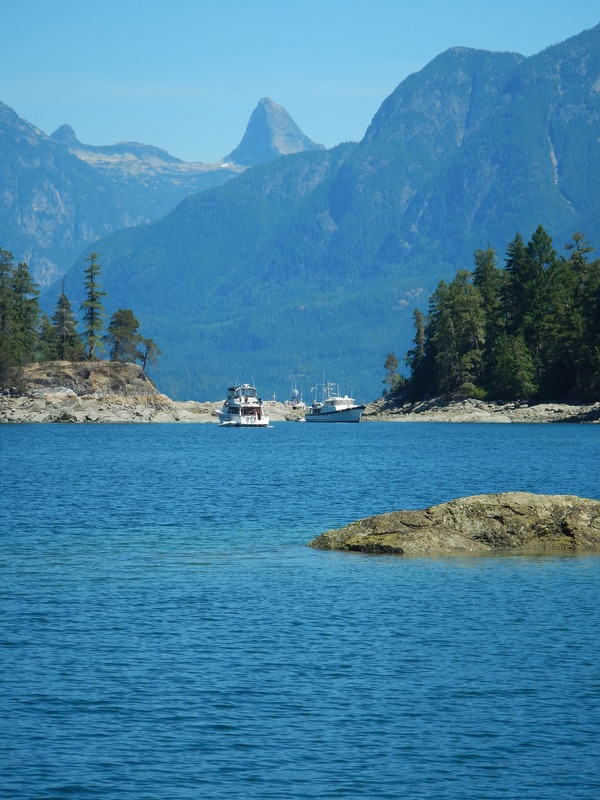 We slip out of the Wilderness and head SSE between the mainland and Double Island. 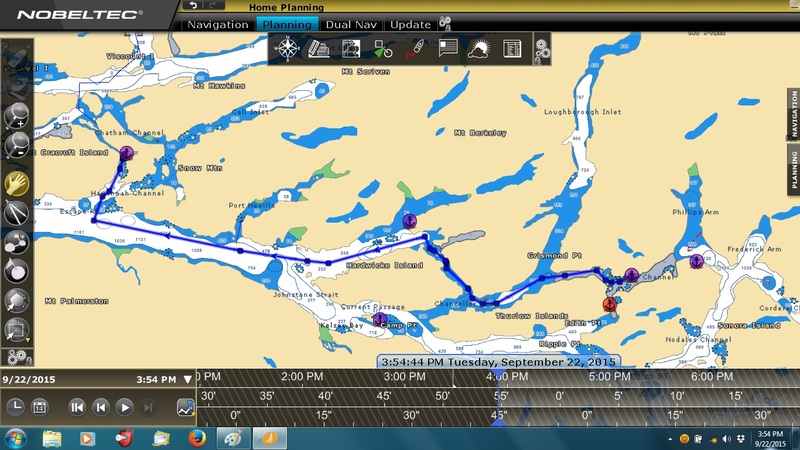 We change our heading to 265ºM to follow the Pryce Channel to the north tip of Raza Island and into the Raza Passage. 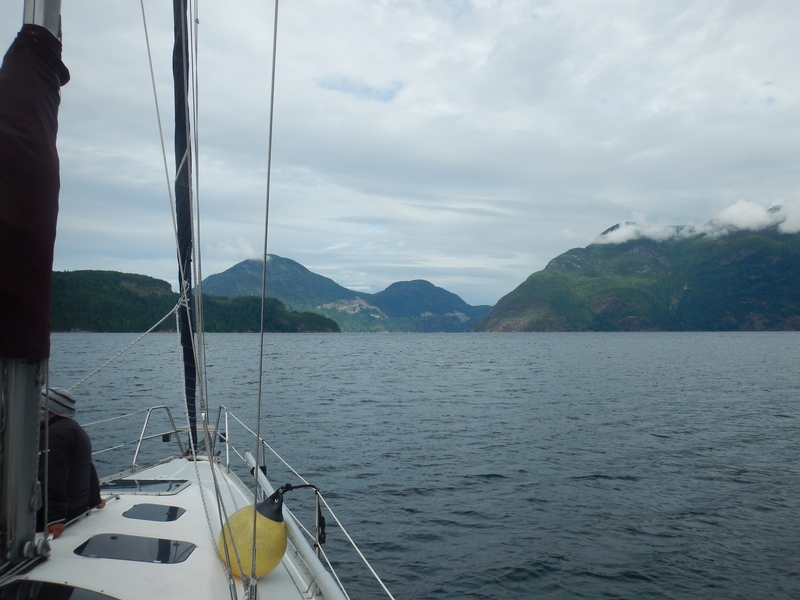 We enter Calm Channel and turn to 308ºM as we head toward the southern tip of Stuart Island. 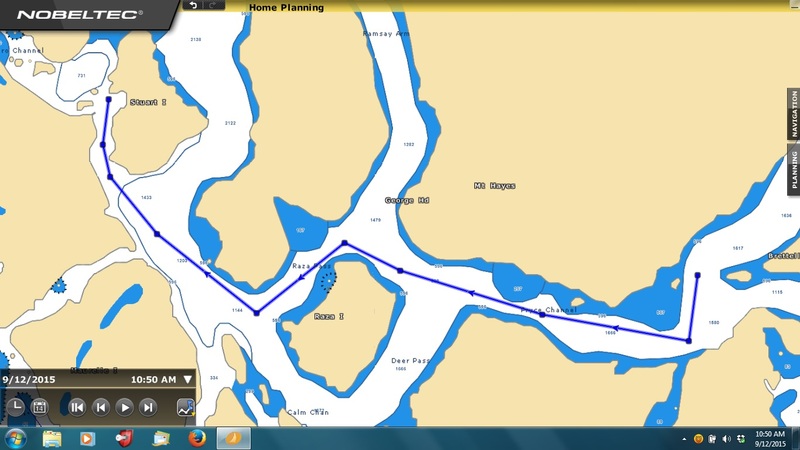 1215 hours we are off the southern tip of Stuart Island with another boat right at the southern tip. Jon & I discuss our strategy for Yuculta Rapids. We agree on the following. 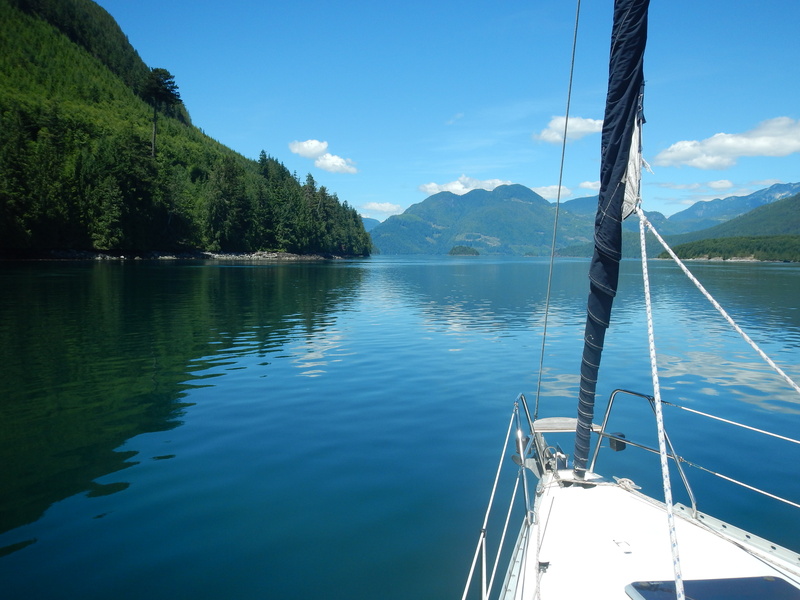 We will go close to slack water time and follow the other sailboat. Jon will be at the helm and I’ll be on the deck with binocs. I’ll be looking for whirlpools, boats yawing, and turbulent water. Everyone is killing time in their own way until 1330 hours. 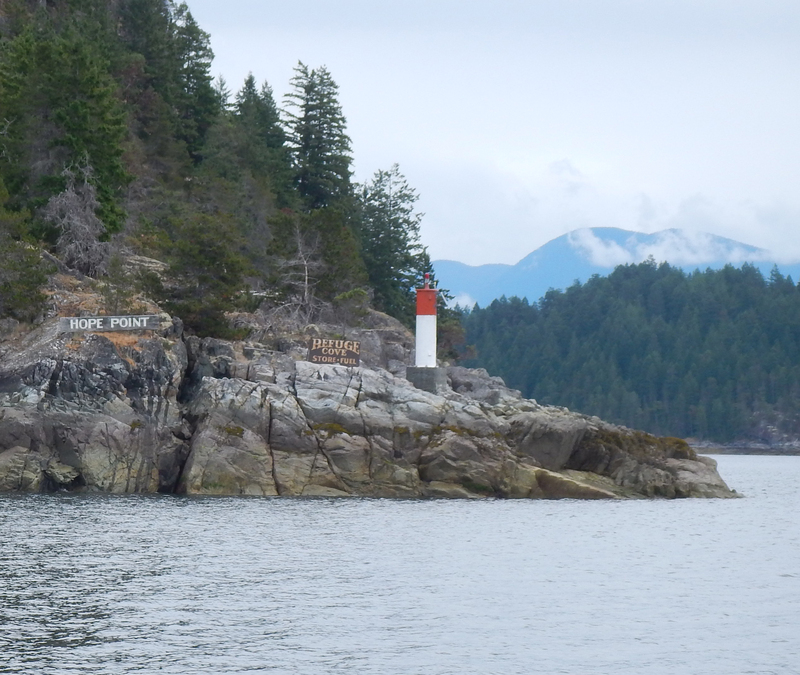 1330 hours we pass harbor point nav light and follow the other boat at a respectful distance as we reach the Whirlpool point nav aid. No yawing, frothing just slack water. 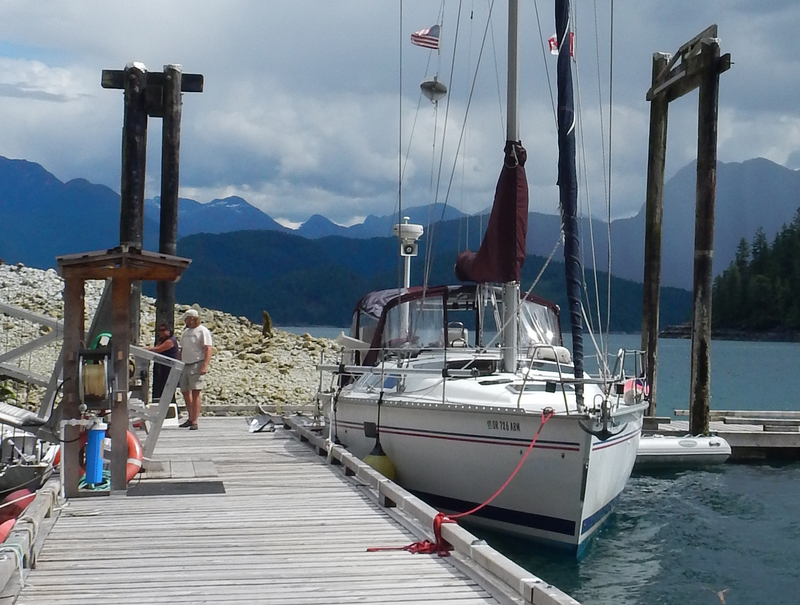 We hit it dead on and our goal was “no drama” with that we pulled into the Big Bay Marina at 1500 hours. 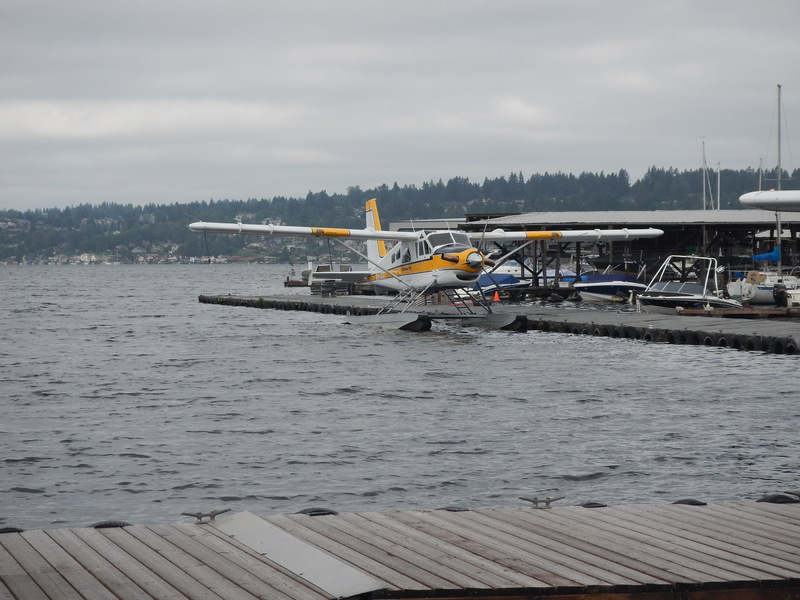 We have a layover until 1200 hours when Teri arrives on a float plane. 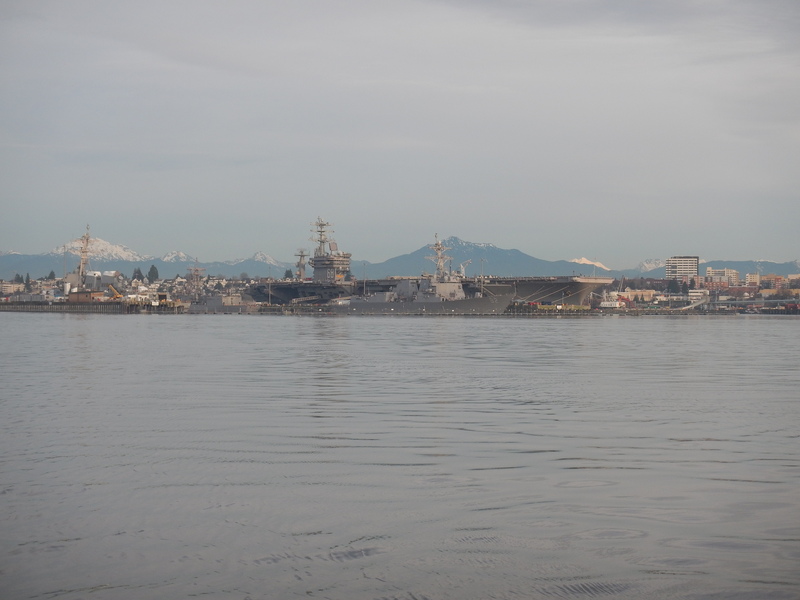 We arrived in Puget Sound one year ago. After three months of appraisal we decided to put roots down. 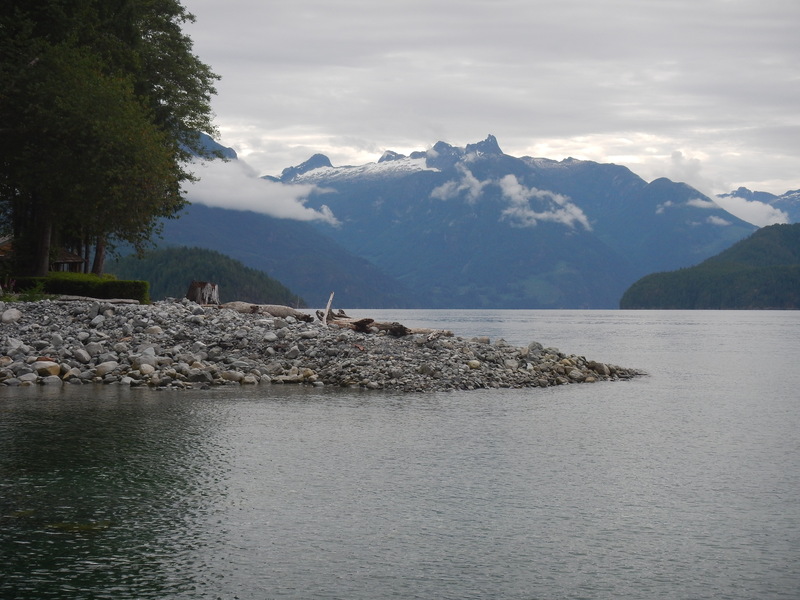 Missing our friends, sun shine, ski patrol, and the meditation center are experiences that we still cherish. The challenges of new experiences have not dimmed our past but rather have encouraged us to embrace these new opportunities. To wander about and find our new home. 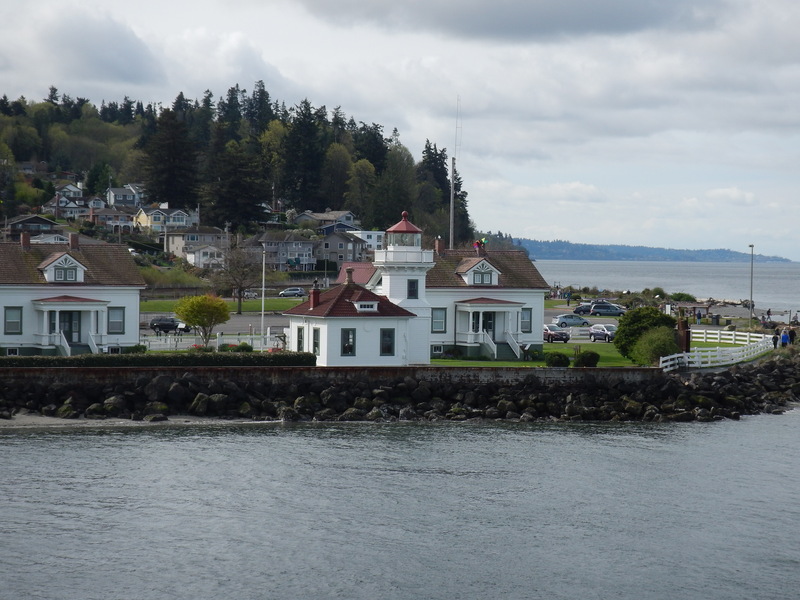 We left home and drove down to Mukilteo to take the ferry over to Clinton on Whidbey Island. 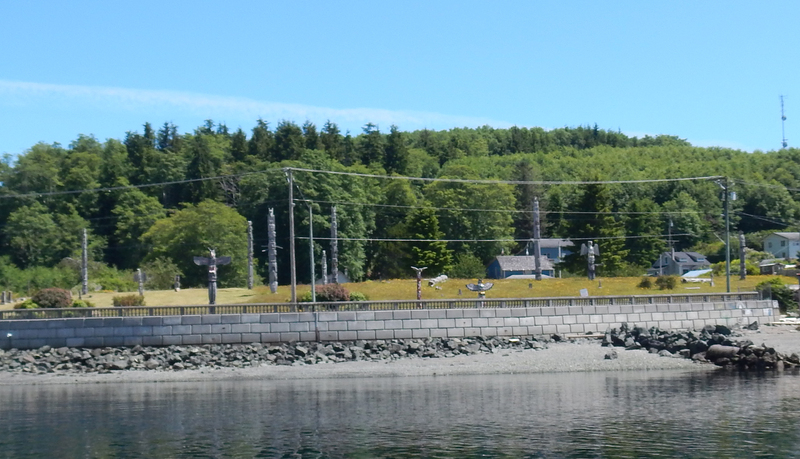 The ferry transit is about twenty five minutes to cross the southern end of Possession Sound below Hat Island. On most crossings, including this morning, the sea state is calm. 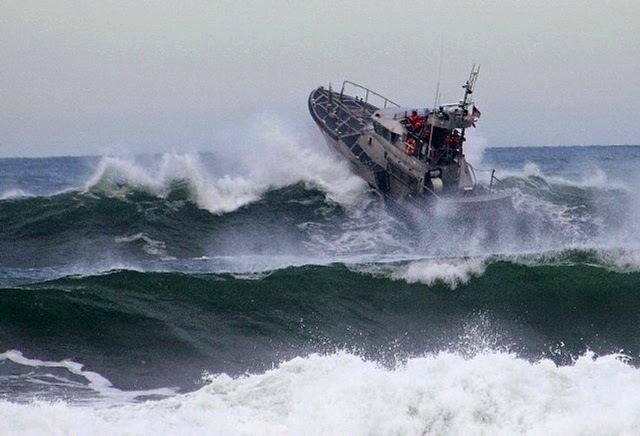 During the fall winter season when some tightly packed cold fronts come roaring thru it can be really bad when there may be fifty knot winds coming up the sound from the south. The winds, the long fetch, and the narrowness of this section of the sound combine to create considerable seas! 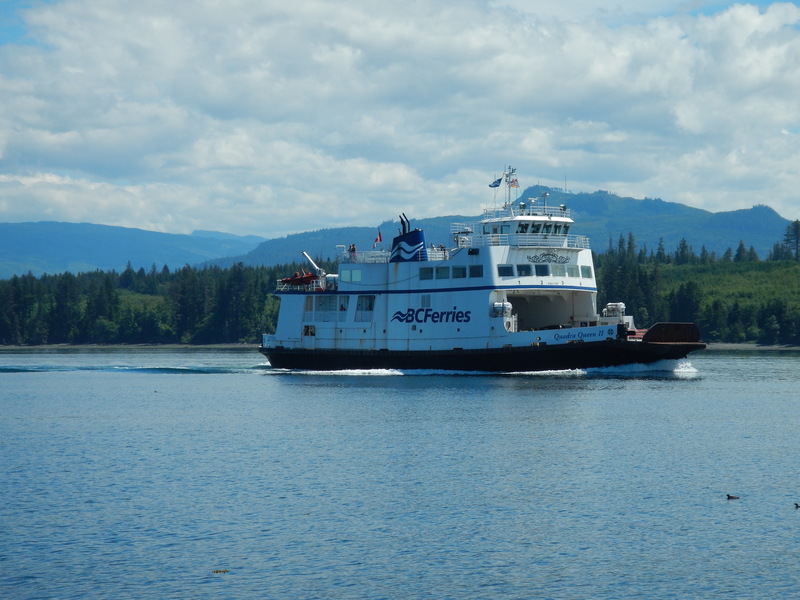 Saturdays wind was much kinder as the ferry approached from Clinton. 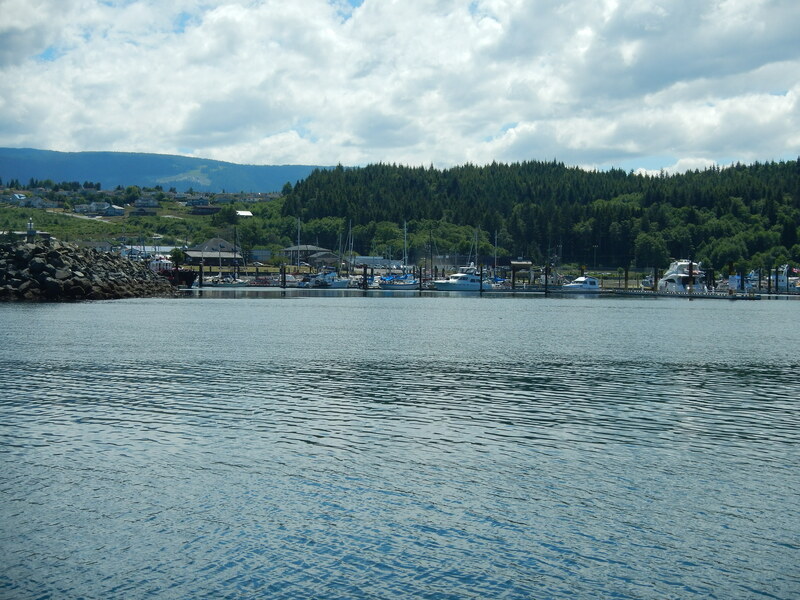 At Clinton we drove north along the Saratoga Passage up to Oak Harbor some 25 miles north and the northern most harbor of the island. 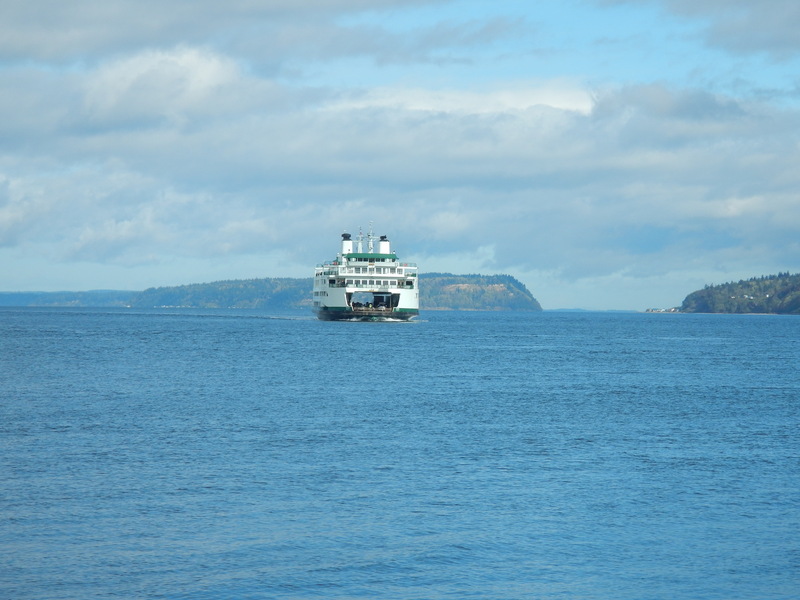 The Saratoga Passage is the body of water between Camano Island and Whidbey Island. Its is named after the war ship Saratoga that cruised Lake Champlain during the war of 1812. 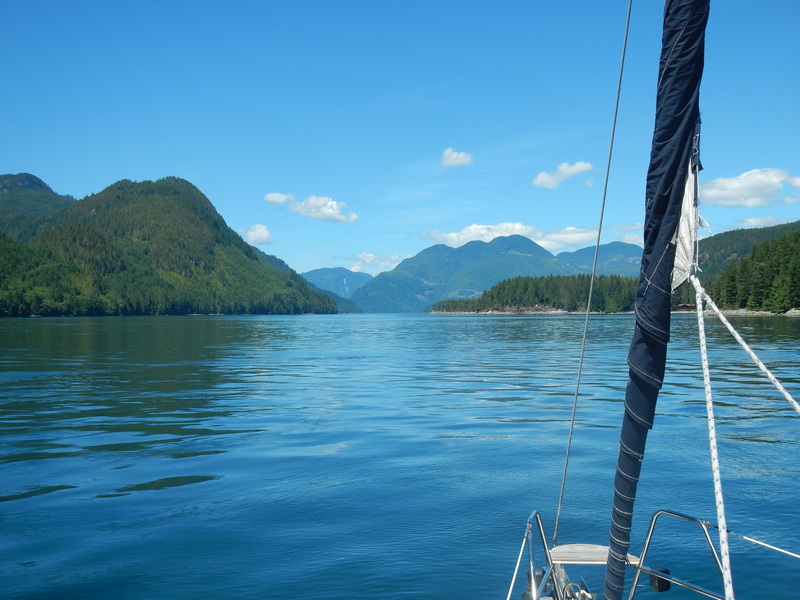 The passage is about 20 miles long in a north orientation and connects with the Straits of San Juan de Fuca thru Deception Pass and the Skagit river empties into Skagit Bay on the north east end. Along the passage there are several marinas and state parks for sailors. 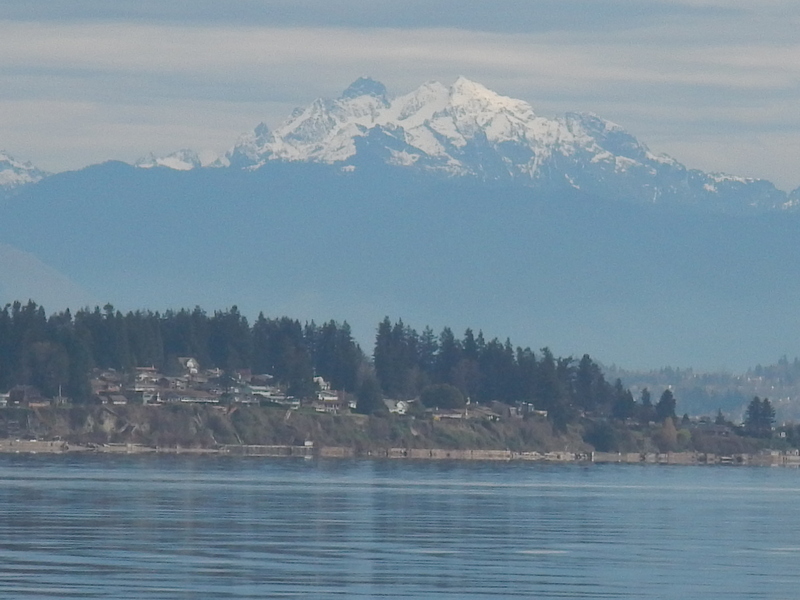 Clinton, Langley, and Oak are the most notable on the west side of the passage. 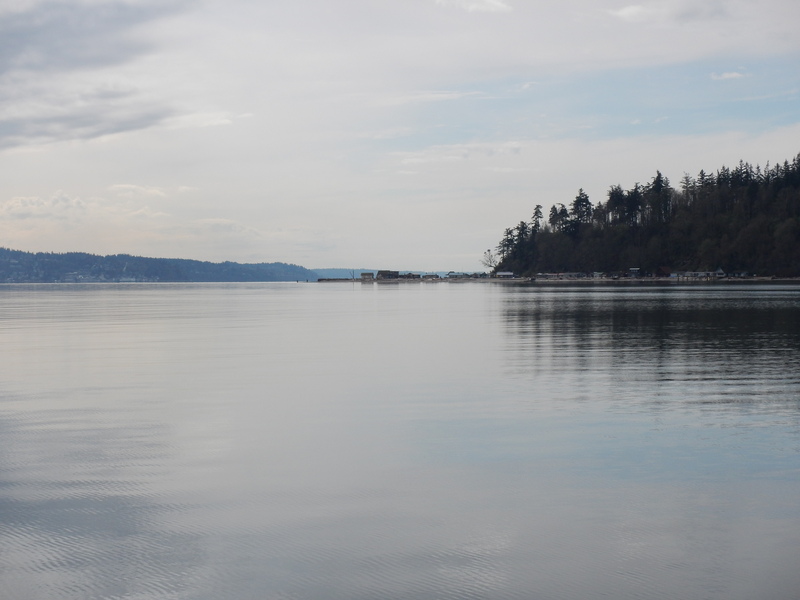 On the east side there are bays and a state park on Camano Island. 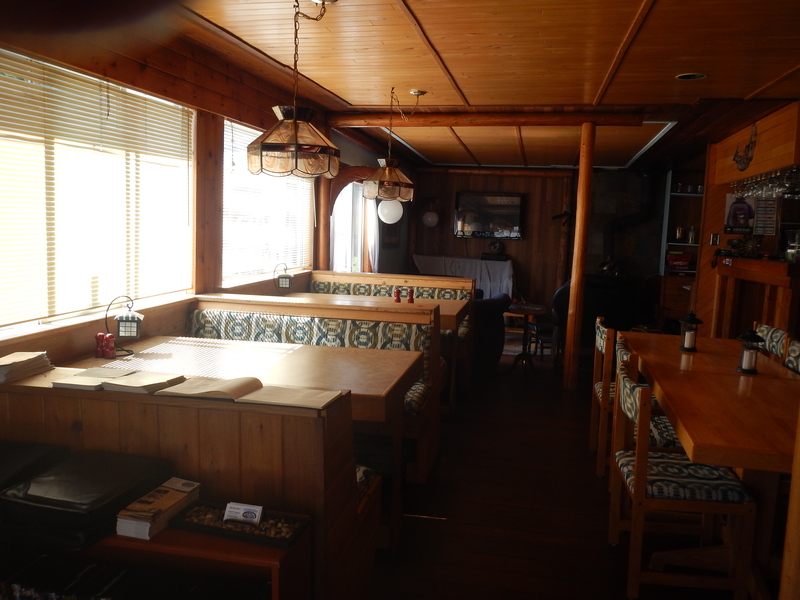 Cabins and small day sailboats can be found at Camano State Park and are managed jointly with the Center for Wooden Boats. 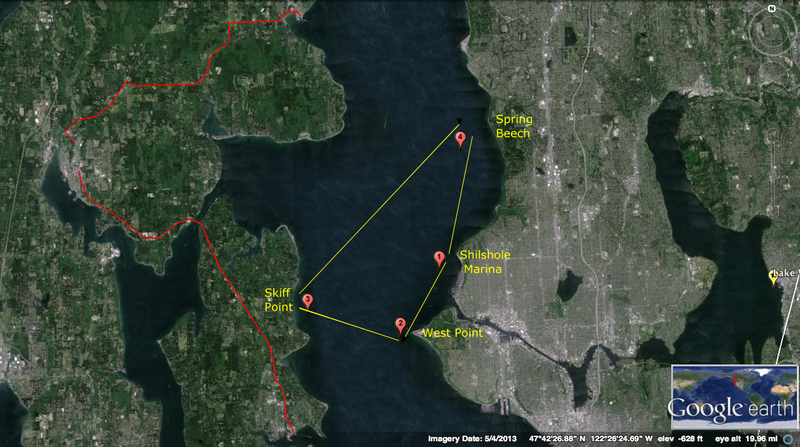 I have day sailed the southern half of the Saratoga Passage from Everett. It is a great area. Plenty of deep water with little traffic. 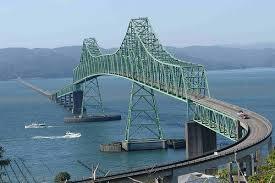 One sailing cruise I would like to do is from Everett thru the Saratoga Passage to the Straits of San Juan de Fuca via Deception Pass. 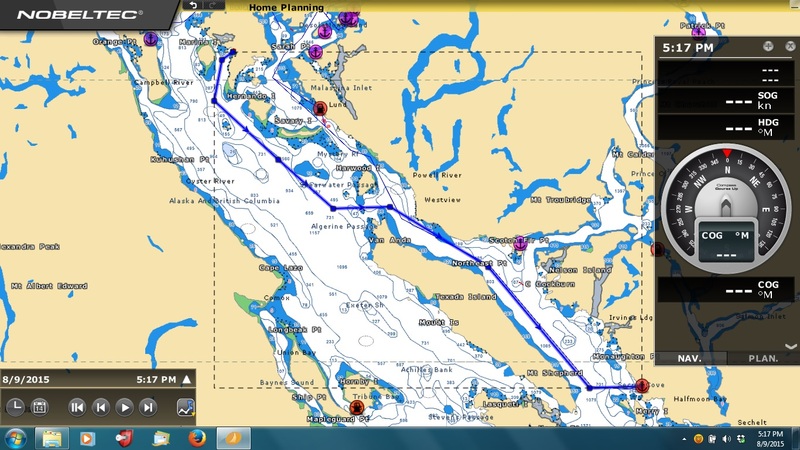 This trip would require correct timing for transit of Deception Pass since it has a seven knot current on the ebb tide. 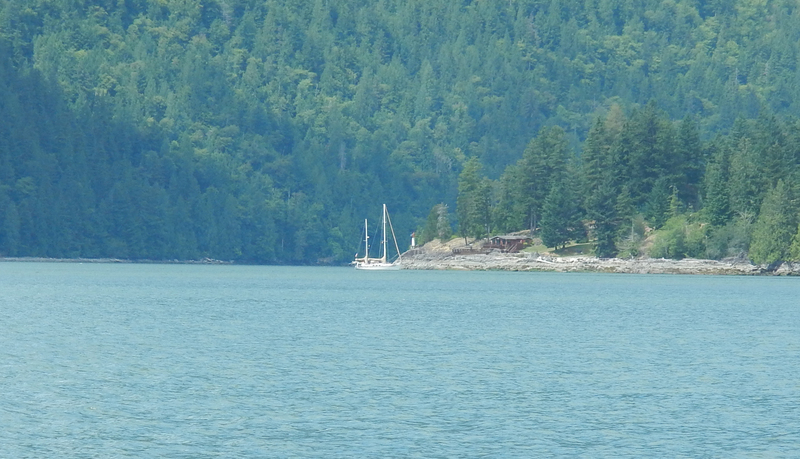 As we continued to drive north to Oak Harbor I was looking forward to the jet boat tour of Deception Pass since it would allow a view of the currents without the risks associated with a sail boat. 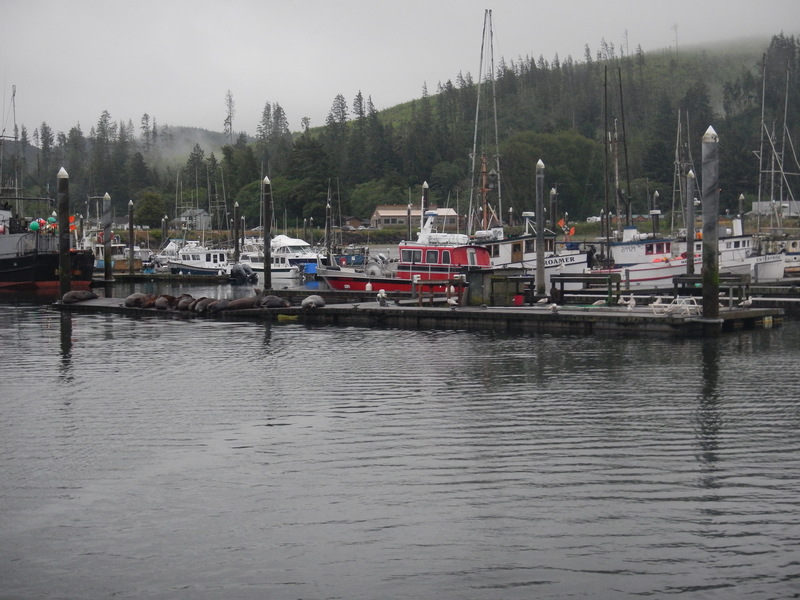 We found the marina but I was disappointed to learn it was to early in the season for jet boat tours thru the pass. 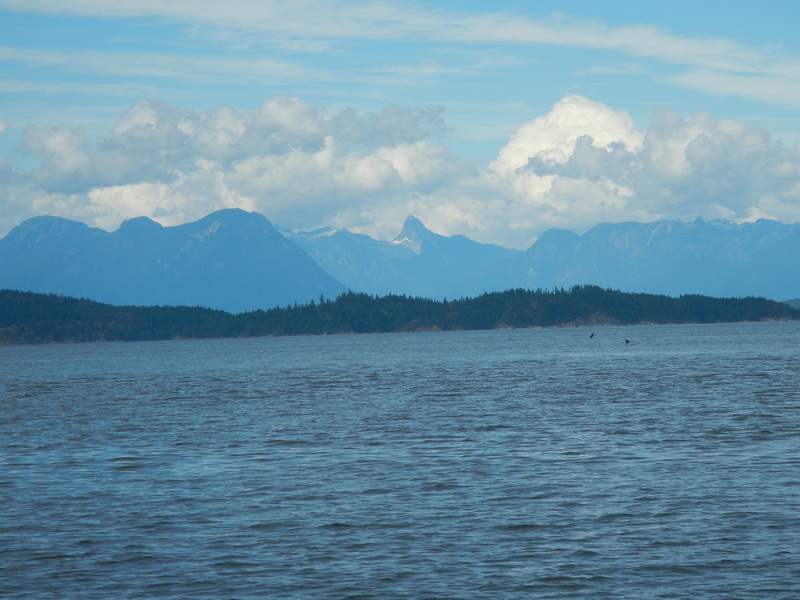 However, March and April are the months when five grey whales come into the Saratoga Passage to bottom feed on shrimp. 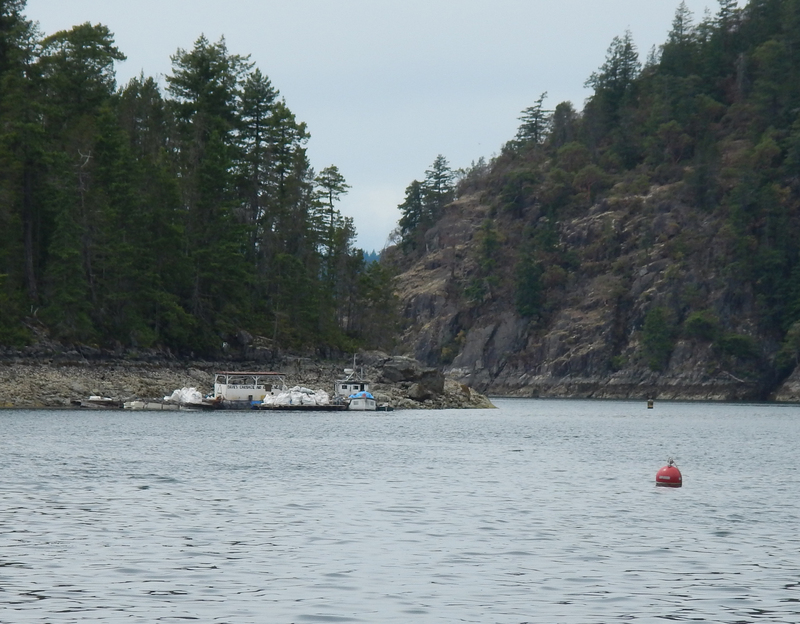 Two weeks earlier we had sighted a grey whale in Steamboat Flats while sailing out of Everett. 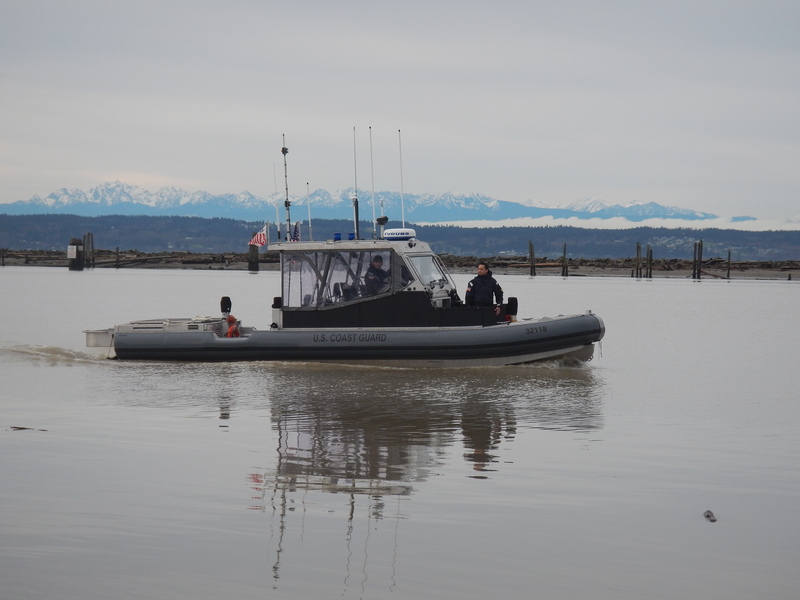 Also local media had reported sightings off Camano Island. 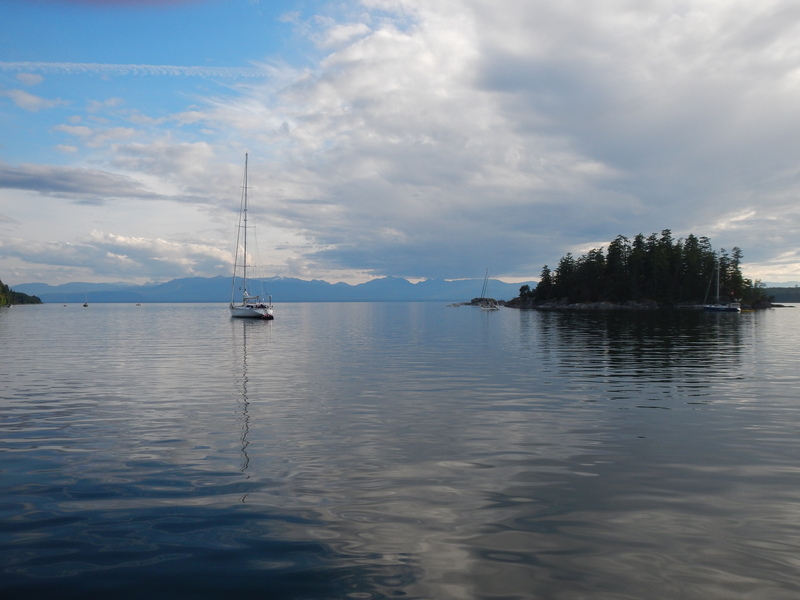 Being opportunists, we signed up for the three hour whale tour of the Saratoga Passage. 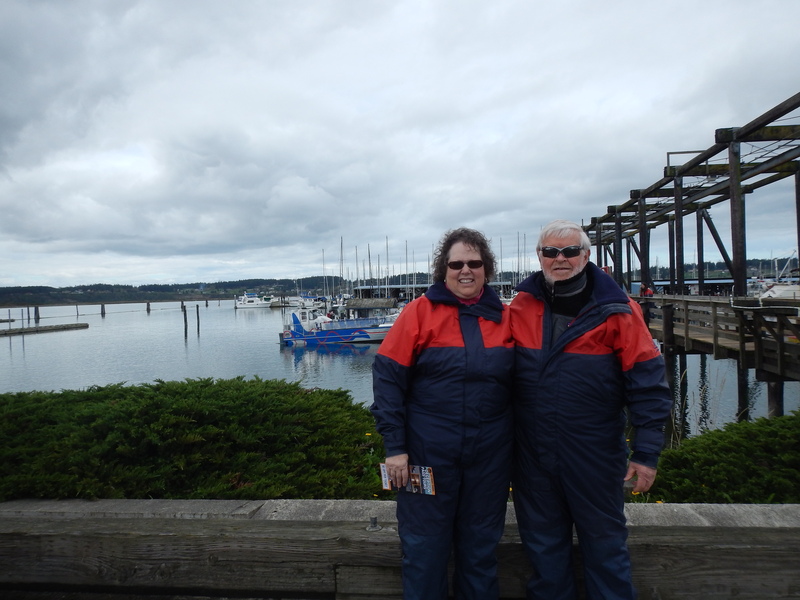 We suited up in our fleece lined expedition suits since the jet boat is an open design and roared out of Oak Harbor and headed south down the passage. At key spots where greys have been spotted they killed the engine and looked & waited. After checking many spots we found two greys feeding off Elger Bay on the west side of Camano Island. Every two to six minutes they would announce themselves by blowing a heart shaped geyser of air & water arching their back and diving back down for more shrimp. 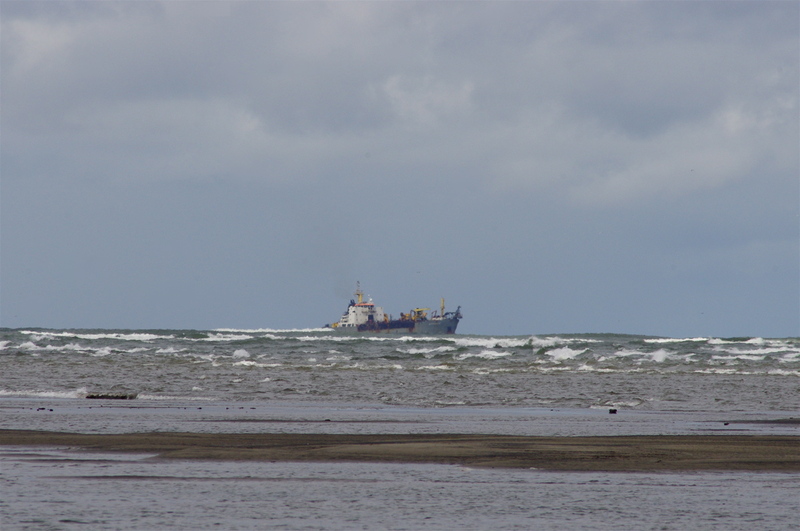 We drifted on the current along with the greys for about 45 minutes before we needed to leave return to Oak Harbor. A lovely time………. A kayak would have been so intimate. A future thought. 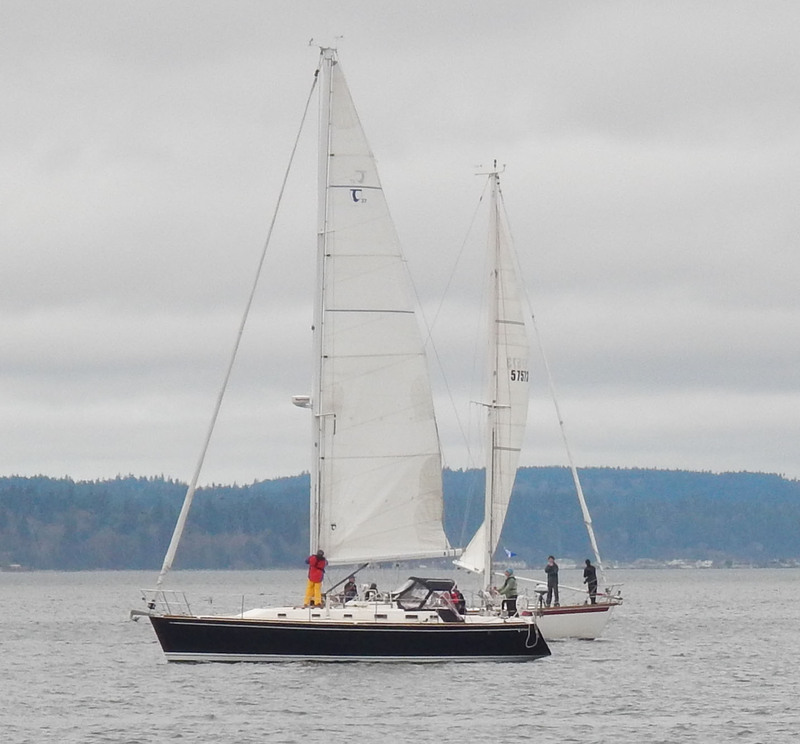 Sunday was a day to sail out of Everett on Scott Selby’s Catalina 34 S/V Duck Soup. 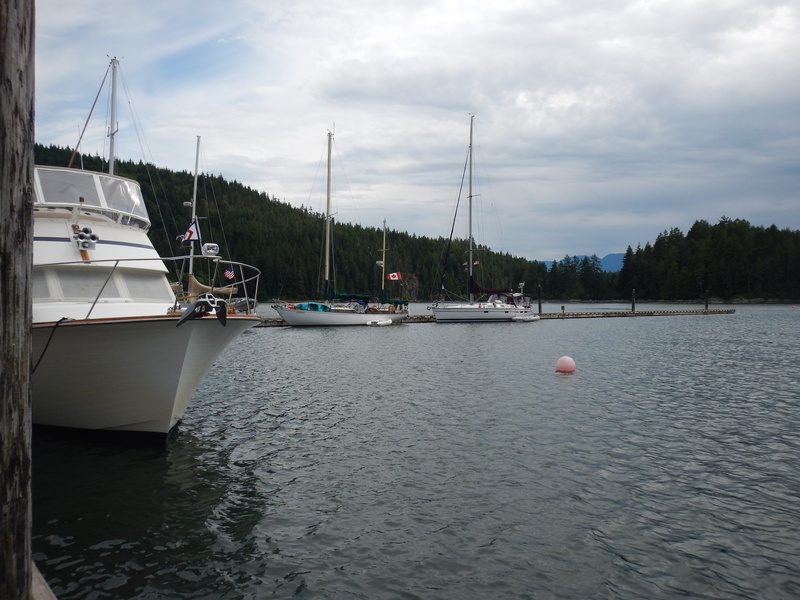 We cast off the lines at 1100 hours, motored out of the marina to a 15 knot wind from the SE. 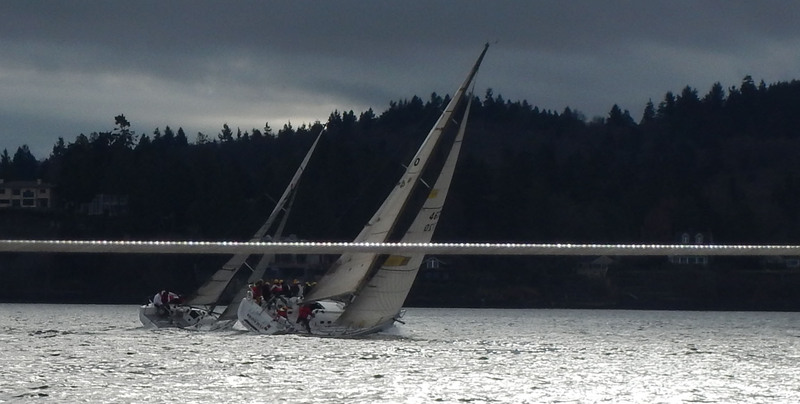 We passed the outer buoy with its residents & I jumped the main, came back to the cockpit & we hauled out the jib for a beam reach over to Whidbey passing south of Hat Island. 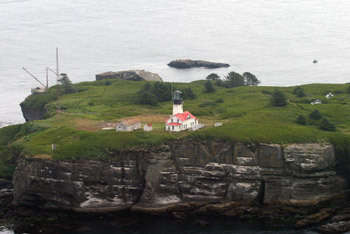 Then a jibe north pass Hat Island up to Camano Island and into the Saratoga Passage. At 1400 hours it was time to return home so we headed back south. 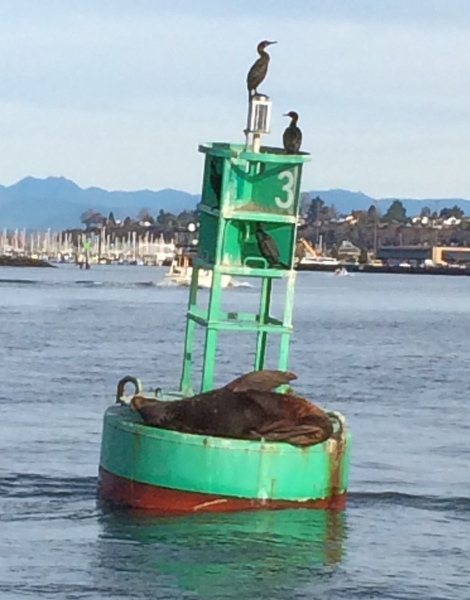 No whales today but great company and conversation. 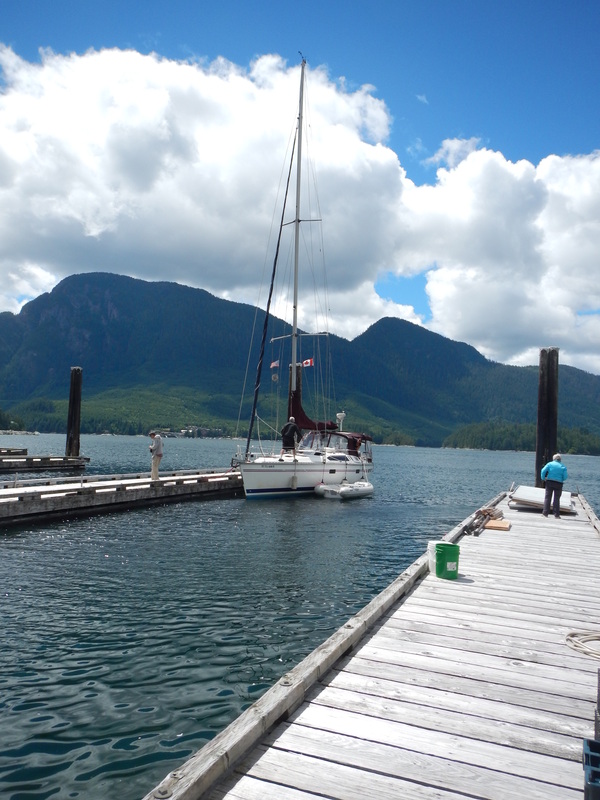 The tide had turned to flood so we had the bow into both the wind and tide. With us pointing up as high as possible into the wind for the starboard tack we were making no headway for thirty plus minutes. 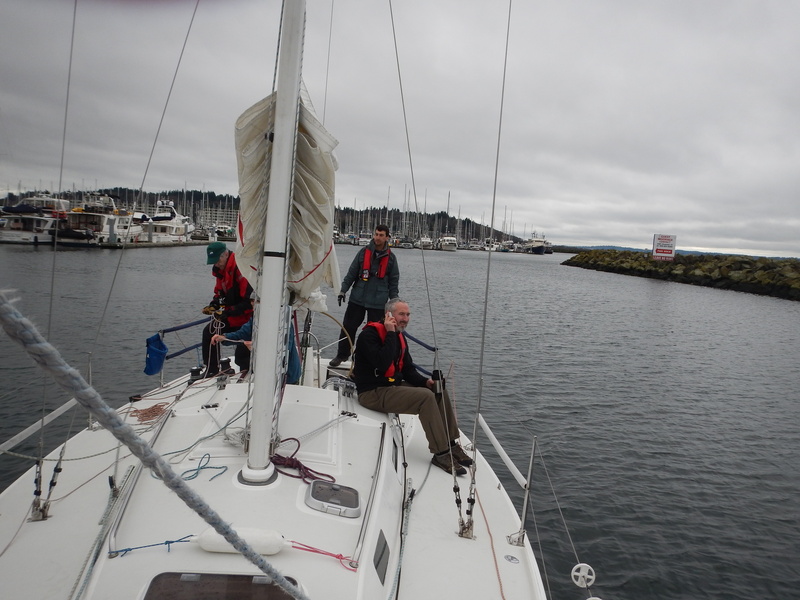 The port tack was more promising for a lay line around the bottom tip of Camano and on the next starboard tack we finally made it around Camano and toward the marina. 1700 hours and we’re dropping the main. Back in the channel to the marina to tie up. A wonderful weekend in our new home.